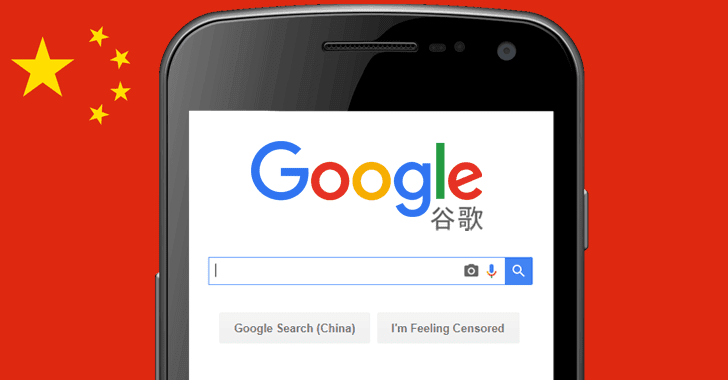 It's now confirmed that Google's long suspected assistance to the Communist government of China to censor and monitor its citizens' online activity runs deeper and is more proactive that initially thought. The Intercept published a bombshell report based on internal Google whistle-blower testimony which shows the internet giant plans to launch a search engine for China with censorship capabilities built into it, which provides a backdoor monitoring platform allowing government authorities to track users' entire search history and even their location. The search system is code-named "Dragonfly," according to a confidential memo outlining the project that circulated inside the company — the contents of which have been leaked to The Intercept by an engineer who worked on the search engine. The Google engineer said that employees were forced by Google bosses to delete the memo as it was authored and circulated among a group voicing concern and dissent over the planned search engine. The "Chinese partner" — thought to be a private company working in tandem with the Chinese government — will store user information in a database on servers in Taiwan. A Dragonfly search engine prototype is under development for use as an app on Android and iOS devices, which would require sign-in. According to the leaked memo a user's searches will be linked up with their personal phone number, and thus even their movements and IP addresses associated with the device will be stored. The confidential "dissent" memo which Google executives have reportedly been relentless in attempting to stamp out accuses the company of creating "spy tools" on behalf of the Chinese government in order to monitor citizens' activity. The Intercept report further describes the specially designed system as removing searches related to democracy, human rights, and peaceful protest. According to three sources familiar with the incident, Google leadership discovered the memo and were furious that secret details about the China censorship were being passed between employees who were not supposed to have any knowledge about it. Subsequently, Google human resources personnel emailed employees who were believed to have accessed or saved copies of the memo and ordered them to immediately delete it from their computers. Emails demanding deletion of the memo contained “pixel trackers” that notified human resource managers when their messages had been read, recipients determined. The report reveals that censored and black-listed terms for the system are to include words and phrases in Mandarin like “human rights,” “student protest,” and “Nobel Prize”. And a Chinese partner company will be able to “selectively edit search result pages…unilaterally, and with few controls seemingly in place," according to the memo. Even though Google CEO Sundar Pichai had previously told company employees that plans for a specialized Chinese search system was in its “early stages” and merely "exploratory," the report reveals employees were told in late July they should get the search system in "launch-ready state" to roll out in a matter of weeks, "pending approval from officials in Beijing". A Google employee interviewed by The Intercept noted the duplicitous tactics used even on those tasked with working on the project: “Leadership misled engineers working on [Dragonfly] about the nature of their work, depriving them of moral agency,” the source said. When news of Google's work a Chinese search engine that would censor users' search results first surfaced last summer, Google maintained that "confidentiality" was essential during the early phases of any project, and that transparency would be greater in the final stages. Multiple international media reports over the past year have revealed China is in the process of erecting a "total surveillance" system to monitor its over 1 billion citizens. China's surveillance network already includes powerful cameras that can detect an individual's facial features from 100 yards away. Likely Google's specialized search system, should it launch, will interface with the vast totalitarian monitoring dragnet already in place. Google executives have a lot to answer for.